Zoho Analytics advanced analytics for Zendesk enables you to easily analyze your data in Zendesk and keep track of key help desk metrics. This helps support managers slice and dice their help desk data and create and analyze reports such as agents' performance, NPS score, ticket inflow, satisfaction rating, and much more. Why Zendesk Advanced Analytics connector? Who can use the Zendesk connector? What do I get when I use this connector? How much does this connector cost? Do you provide trial evaluation for this connector? What do you mean by 'Users' in the pricing plan? What do you mean by 'Rows' and how is it calculated in the pricing plan? How do I setup the Zendesk Advanced Analytics connector? How long should I wait for my Zendesk company data to initially appear in Zoho Analytics? I got this email which said 'Setup Process Failed'/'Synchronization Process Failed'. What should I do? How frequently can I synchronize my data with Zoho Analytics? Can I edit the Zendesk connector Synchronization setting? 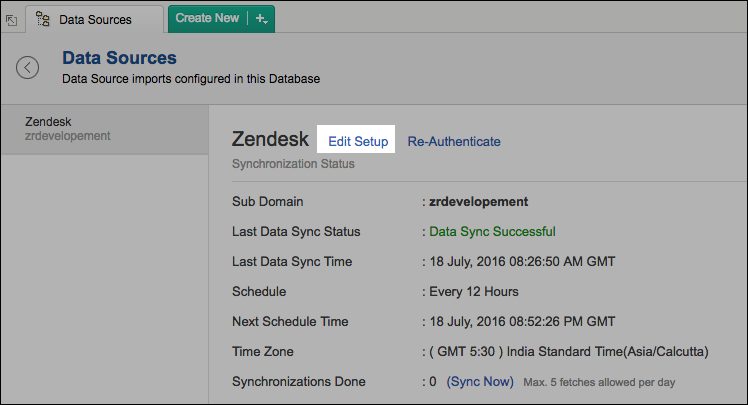 Can I synchronize my Zendesk company data instantly? In whose account will the Zendesk connector be setup? What are the modules in Zendesk on which I could create reports using this connector? How to create reports with this connector? Can I setup the Zendesk connector in any other existing databases or in any other advanced analytics database? Can I configure multiple Zendesk setups? How can I configure multiple Zendesk setups? Can I transfer my Zendesk connector to another admin account? How can I remove the setup? What are the report types supported by Zoho Analytics? What are the default reports & dashboards created by Zoho Analytics, on setting up this connector? Can I modify the default reports that have been created by the Zoho Analytics connector? If so, how? How do I create reports using fields/columns across different modules? What are 'Formulas' in Reports? What are the default formulas added by Zoho Analytics, on setting up this connector? How do I create my own custom formulas in Zoho Analytics? Can I add/modify data in the Zendesk data tables (modules) from within Zoho Analytics? Can I add new columns to the Zendesk data tables (modules) from within Zoho Analytics? Can I add new data tables in this Workspace to create reports & dashboards? Can I combine data from other sources with the data from Zendesk to create reports and dashboards? Can I join data from multiple tables to create reports? How do I share the reports in Zoho Analytics with my colleagues? Why are other members in my company not able to access the reports created? How can other members in my company create reports? What are the user roles available in Zoho Analytics? Why can't other users edit the reports that I have shared to them? Can I share the same report created to multiple users with different criteria associated, so that they see different data? Can I export a report/dashboard? How can I print the reports & dashboards created in Zoho Analytics? How can I email reports & dashboards created in Zoho Analytics in a scheduled manner? How do I embed my reports in my intranet, blog or presentation? What are the popular business applications that I can integrate Zendesk with? Will a relationship (lookup) be created between Zendesk and the third party applications that I integrate it with? How do I get technical support on Zoho Analytics connector? Can I have someone from Zoho do a demo of this connector for me? 1. What is Zoho Analytics? Zoho Analytics is an on-demand reporting and business intelligence solution that helps you derive insights on your business data through its powerful reporting and analytical capabilities. You can create dynamic reports in minutes, with no IT help. Complete Online Reporting & Business Intelligence service accessible anytime and anywhere! Easy to adopt 'Spreadsheet-like' interface with powerful drag & drop based reporting features for quick report creation. Supports a wide range of reporting capabilities like Dashboards, Charts, Pivot Tables, Summary Views and simple Tabular reports. Supports creation of KPI widgets in dashboards to track key performance metrics. Supports data import from variety of file formats like Excel, JSON, HTML etc. Also, supports data import from cloud storage and Web URLs. Supports periodic scheduling of import. Integrated with Zendesk to derive insights from your Zendesk data using the powerful reporting capabilities of Zoho Analytics. Integrated with other Zoho products such as Zoho CRM, Zoho Projects, Zoho Books, Zoho BugTracker, Zoho Recruit etc. Zoho Analytics is integrated with popular business applications like Google Analytics, Salesforce CRM, QuickBooks, MailChimp (Beta) etc. You can also integrate your own applications with Zoho Analytics using Zoho Analytics API. Integrated with Zapier to power up import from over 500+ apps. With an advanced formula engine, you can derive key business metrics from your data. Also, supports SQL (Structured Query Language) driven querying for powerful report creation. Real-time collaboration by sharing data and reports in read or read-write modes with your colleagues & friends. Export and Print reports in variety of formats. Notify reports via email. Publish reports for wider consumption. Embed reports within your websites, web applications and blogs. 2. Why Zendesk Advanced Analytics connector? Zendesk Advanced Analytics enables you to import your helpdesk data in Zendesk into Zoho Analytics for advanced reporting and analysis. This connector brings in all the capabilities of Zoho Analytics described above to Zendesk users. A full-featured business intelligence (BI) and reporting tool that can slice & dice your Zendesk data to create any report/dashboard you require. Over 75+ handpicked reports/dashboards that anyone using Zendesk will find great value in. Embed your reports in websites, blogs etc. 3. Who can use the Zendesk connector? Any Zendesk Administrator who wishes to visualize and analyze their helpdesk metrics can use this connector. 4. What do I get when I use this Connector? As a Zendesk user using this connector brings you immense benefits. You get to look at your helpdesk data in Zendesk in ways you couldn't have looked at before. It enables you to do powerful analysis and create insightful reports & dashboards. You can create a wide range of reports including agents' performance, NPS score, ticket inflow, satisfaction rating and do much more with ease. Zoho Analytics drag-and-drop based reporting is so easy to use that you could create any report or dashboard on your Zendesk data with no IT help or technical knowledge and share them to your colleagues. 1. How much does this connector cost? This connector is available in all the paid plans of Zoho Analytics. Refer to the Zoho Analytics pricing page. 2. Do you provide trial evaluation for this connector? Yes, we do provide a 15-day free trial for this connector from the date of setup. 3. What do you mean by 'Users' in the (connector) pricing plan? Anyone to whom you privately share your databases, tables (data), reports and dashboards, created in Zoho Analytics, for collaboration is considered a 'User' in Zoho Analytics. A user is identified by his/her unique email address, with which their Zoho Analytics account was registered. Suppose you subscribe to the Zoho Analytics Standard plan, you can privately share the data/reports in your account and collaborate with 4 other persons. Now your Zoho Analytics account is said to have 5 users (including yourself). Click to know more about the Zoho Analytics user model. 4. What do you mean by 'Rows' and how is it calculated in the pricing plan? In Zoho Analytics, a row or record is defined in the same context as in a database (or spreadsheet). In simple terms, a table consists of rows (records) and columns (fields). Each row in a table represents a set of related data and has the same structure. For example, in a table that represents "Invoices", each row would represent a single invoice record. The number of rows calculated for pricing, is the sum of all rows/records stored across all your database tables in your Zoho Analytics account. 1. How to Setup Zendesk Advanced Analytics Connector? 2. How long should I wait for my Zendesk data to initially appear in Zoho Analytics? After configuring this connector, you might have to wait sometime for the initial fetch to happen. You will receive an email notification once the import is complete. If you access the database before the initial fetch, it will not display any data. 3. I got this email which said 'Setup Process Failed'/'Synchronization Process Failed'. What should I do? The import/sync process of your Zendesk data can fail sometimes, due to a variety of reasons. Hence you may receive such mails occasionally. The Zoho Analytics team will look into it immediately and get back to you, after taking the required corrective action. Open the database in which you have setup the connector. Click the Zendesk button (or Data Sources button - in the case where the database contains multiple tables) in the Explorer tab. In the Data Sources tab that appears click the Retry Now link. If the issue persists please do write to support@zohoreports.com. We will look into it and get back to you immediately. Case 2: You will receive the Synchronization Failed mail if there is any failure during the data synchronization process between Zendesk and Zoho Analytics, after the initial setup & import of data. This might be a momentary failure due to any internal issues. This import schedule will get suspended if there are five successive failures. 4. How frequently can I synchronize my data with Zoho Analytics? If you have purchased the basic plan, you will be able to synchronize your data only once every day. If you are in are a user of the standard plan or above, you will be able to synchronize your data at one of the hourly intervals mentioned below. 5. Can I edit the Zendesk connector Synchronization setting? Yes, you can edit the Zendesk connector synchronization setting if you are the administrator of the Zoho Analytics account. Open the Zendesk Insights Workspace. Click the Zendesk button in the Explorer tab (or Data Sources button - in the case where the database contains multiple connector setups). In the Data Sources tab that opens, click the Edit Setup link. Make the necessary changes and click Save. 6. Can I synchronize my Zendesk data instantly? 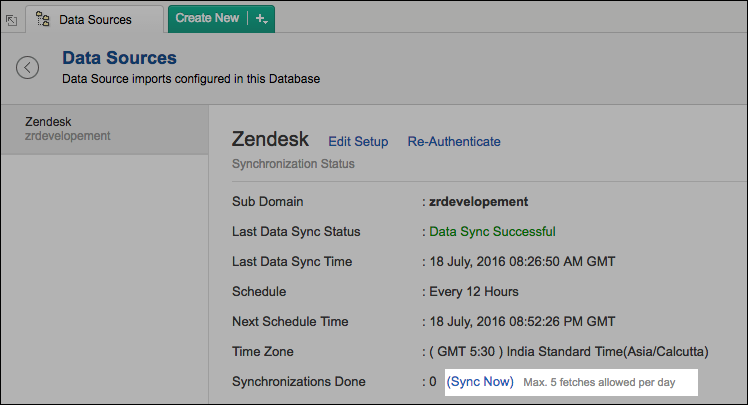 Yes, you can synchronize your Zendesk data instantly when needed. Login to your Zoho Analytics account. In the Explorer tab, click Zendesk button (or Data Sources button - in the case where the database contains multiple connector setups). In the Data Sources tab that opens click Sync Now. 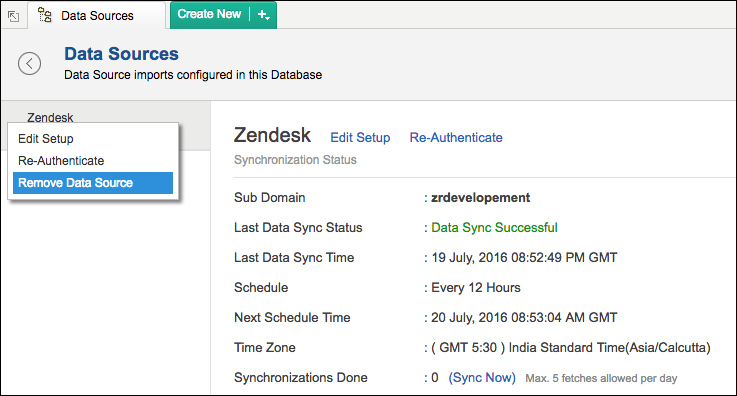 Zendesk data will get instantly synchronized. This option can be used to a maximum of five times a day. 7. In whose account will the Zendesk connector be setup? It will be setup in the corresponding Zoho Analytics account of the Zendesk Administrator who has configured this connector. 8. What are the modules in Zendesk on which I can create reports? 9. How can I create reports using this connector? 10. Can I setup the Zendesk advanced analytics connector in any other existing Workspaces or in any other advanced analytics database? Click the Import Data button in the Explorer tab or Select New > New Table/Import Data. In the Create New Table tab that opens, select Import from Zendesk. In the Import from Zendesk dialog that opens, authenticate your Zendesk account. Select the modules that needs to be imported into Zoho Analytics. Select the necessary schedule import options in the Schedule Import Settings section and click Next. Your Zendesk data will be imported into your database. Refer to this setup presentation. 11. Can I create multiple Zendesk setups? Yes, you can configure multiple Zendesk setups if you have subscribed for a paid plan (Standard and above). 12. How can I configure from multiple Zendesk setups ? You can configure multiple Zendesk setups if you have subscribed for a paid plan (Standard and above). You can choose to import multiple organizations in the same database or in a different database. If you wish to import the data in an individual database refer to this question. 13. Can I transfer my Zendesk connector to another admin account? At present, we do not provide an option in the user interface. If you require this transfer, please do mail us to support@zohoreports.com and we will do this for you. 14. How do I remove this setup? In the Data Sources tab that opens click the Settings icon and select Remove Data Source as shown in the snapshot. 1. What are the report types supported by Zoho Analytics? Zoho Analytics supports a wide variety of reports. 2. What are the default reports & dashboards created by Zoho Analytics, on setting up this connector? When you setup/configure the Zendesk Integration Connector, 75+ default reports & dashboards are automatically created. These hand-picked reports will be pretty useful in analyzing your help data effectively. 3. Can I modify the default reports that have been created by this connector? If so, how? Yes, you can modify the default reports. If you are the 'Administrator' or a 'Workspace Administrator' of the Zoho Analytics account in which the Connector is configured (Refer Managing Users in Zoho Analytics). To modify the reports click the Edit Design button in a report's toolbar and you will be able to make the changes. If you are just a user who's been shared the report, save a copy of the report by clicking Save > Save As. Now you can edit this new copied report. 4. How do I create reports using fields/columns across different modules? Columns from across different Zendesks modules are joined by default. Therefore, you can create reports by simply dragging and dropping the respective columns. 5. What are 'Formulas' in reports? Formulas, as the name indicates, are calculations that you could define in Zoho Analytics to help you create the required reports. Zoho Analytics provides a powerful formula engine to create any type of calculations required, to enable creating the required reports. Refer Adding Formulas in Zoho Analytics to know more. 6. What are the default formulas added by Zoho Analytics, on setting up this connector? The default formulas added by Zoho Analytics are listed below. You can view these formulas by opening the corresponding table and selecting Add > Edit Formulas from the toolbar. First Reply Time (hrs) "First reply time in minutes within business hours"/60 Custom Displays the number of hours between the time a ticket is created, and the first reply for a ticket. within business hours"/60 Custom Displays the number of minutes between the time a ticket is created, and the resolution provided for the ticket. Ticket Touches if("Assignee stations"< = 1,'One Touch','Multi Touch') Custom Displays if the ticket was handled by a single agent or multiple agents. 'Completed','In Progress') Custom Displays the status of the ticket. Age tier of the First reply for the tickets. Age tier of all Tickets. Ticket handling Mode if(isnull("Solved at"), if(datediff( "Due date",currentdate( )) < 0, 'Overdue','Ongoing'),if(datediff( "Due date","Solved at") < 0, 'Overdue','In Time')) Custom Displays the ticket handling mode ie. if the ticket is solved, ongoing or overdue. 7. How do I create my own custom formulas in Zoho Analytics? Refer to the Adding Formulas in Zoho Analytics help page. 8. Can I add/modify data in the Zendesk data tables in Zoho Analytics? No, you cannot add/modify data in the Zendesk data tables. Data from Zendesk modules gets automatically synched into Zoho Analytics in the different tables (one table for one module). You cannot edit any of this data or add new data records from within Zoho Analytics. However you can add new tables and add/import data into that, to create reports combining it with the data from Zendesk. 9. Can I add new columns to the Zendesk data tables in Zoho Analytics? No, you cannot add new columns. But, you can add Formula Columns and Aggregate Formulas (i.e., calculated fields) to these tables to help you create powerful reports. Refer Adding Formulas to know more on this. 10. Can I add new data tables in this Workspace to create reports & dashboards? Yes, you can add new data tables. Click New > New Table to add a new table in the existing Zendesk Workspace. With this feature, you can import data from other sources or add them manually into your Workspace to analyze and create reports combining this with your Zendesk data . You can also import data from other business applications like Google Analytics, Salesforce CRM etc. 11. Can I combine data from other sources with the data from Zendesk to create reports and dashboards? Yes, you can combine data from your other sources with your Zendesk company data for analysis. To do this, you need to add/import a new data table into the Zendesk Workspace as explained in the previous question and then define a look-up to join it with the table from Zendesk. To define a lookup relationship between two tables, it is essential that the tables have at least one column which is common between them. Follow the below steps to look up a column from Zendesk along with the data from any other source. Open the corresponding table, right click the column header and select Change to Lookup Column. In the Change to Lookup Column dialog that opens, select the column to look up. Please do note that you cannot create a Lookup column inbetween the Zendesk tables. 12. Can I join data from multiple tables to create reports? Yes, you can join data from multiple tables to create the reports. Refer to the previous question for detailed help on this. 13. What are Query Tables? Query Table allows you to pull data from the tables by writing standard SQL SELECT Queries. You can create reports over this Query Table as you do over a data table. Refer here to know about how to create Query Tables in Zoho Analytics. 1. How do I share the reports in Zoho Analytics with my colleagues? You can share the default reports provided in the Zendesk Connector and the reports you have create, with other users in your portal. Refer to Sharing and Collaboration help page for more details on this. Once you privately share a report to your colleagues they will be able to access the reports as you do. Refer here to know how to access the reports. 2. Why are other members in my company not able to access the reports that I create? When a Zendesk Administrator configures the Zendesk - Zoho Analytics connector, the tables and reports will be available only to him/her, by default. The Administrator has to share the database with other members of the company. Only then will the default reports be accessible by those members. To know more, refer to Sharing and Collaboration help page. 3. How can other members in my company create reports? The Zendesk Administrator who has setup the connector should share the tables present in 'Zendesk Advanced Analytics' database with other members of the company. Once this is done, the shared users can create reports based on those tables. 4. What are the user roles available in Zoho Analytics? Zoho Analytics offers three user roles - Administrator, Workspace Administrator and User. Click to know more about the Zoho Analytics User Model and User Roles. 5. Why can't other users edit the reports that I have shared to them? This is the expected behavior. Only when the users being shared is set as a Workspace Administrators, they can edit the reports. If a normal user wants to edit the report, he/she will have to save the report with a new name using the Save As option toolbar. The User can edit this report. To know more about user roles, click here. 6. Can I share the same report created to multiple users with different criteria associated, so that they see different data? Yes, you can. Refer the topic Apply filter criteria. 7. Can I export a report/dashboard? Yes, you can export the report/dashboard in various file formats such as CSV, EXCEL, PDF, HTML and Image. Click to know more. 8. How can I print the reports & dashboards created in Zoho Analytics? In order to print the report/dashboard, you first need to export it. You can export the report in various file formats such as CSV, EXCEL, PDF, HTML and Image. Click to know more. If you are a user to whom a report has been shared and you want to take a print, ensure you have been provided the Export permission by the Administrator to the report, only then you will be able to print the report. 9. How can I email reports & dashboards created in Zoho Analytics in a scheduled manner? If you are the Administrator of the Zoho Analytics connector or a 'Workspace Administrator', you can schedule reports and dashboards to be emailed automatically. Refer to the email schedule section in this help documentation. 10. How do I embed my reports in my intranet, blog or presentation? You can easily embed the reports & dashboards created in Zoho Analytics in your website, web application or blog. Refer Embedding in Web Pages/Blogs to know more about this. 1. What are the popular business applications that I can integrate this connector with? You can integrate and perform cross-functional analytics with almost all the business applications that Zoho Analytics offers integration with. 2. How can I analyze the data from the other business applications along with Zendesk? In the Create New Table tab that opens, select the application that you wish to import. 3. Will the related modules from Zendesk and other third-party application be created automatically? No, a lookup relationship will not be created between the Zendesk modules and the modules of the application that you are trying to import automatically. 1. How do I get technical support on Zoho Analytics connector? We offer 24x5 technical support (Monday to Friday). In case if you need our assistance kindly do mail us your questions to support@zohoreports.com. 2. Can I have someone from Zoho do a Demo of this connector for me? Yes, certainly. Register for a demo in this page.